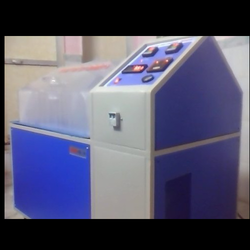 Leading Manufacturer of cyclic salt spray chamber from Thane. Owing to our vast expertise in this area, we are eminent manufacturer, trader and supplier of Cyclic Salt Spray Chambers. Modern manufacturing procedures as per industrial standards are implemented for the production of these products. Our offered product is available in various specifications, in accordance with varied customer demands. These products are well recognized for its dimensional accuracy and longevity in the market.